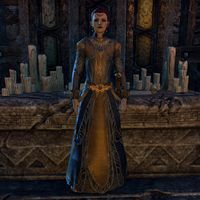 High Priestess Solgra is an Orc priestess and the head of the priests of Trinimac in Orsinium's Temple of Ire. "Ah, another traveler arrives in our grand city! Welcome, welcome! Are you one of the chosen? Do you bear the letter from the Forge-Mother?" I have the letter. Who are you? "I am a high priestess of Trinimac, serving in Orsinium's temple. Like you, I am here at the request of Forge-Mother Alga to help revive the ancient traditions of truth, honor, and unity. I also greet new arrivals. Tell me, how was your journey?" I helped a caravan that was attacked by the Winterborn. Supplies for the outlying clans were stolen. "We've received similar reports. Just one of a series of unfortunate incidents that we plan to rectify. Orsimer soldiers and even the king himself are looking into this. King Kurog believes that even those who refuse his rule must be cared for." I know where they took the supplies. "Truly? Perhaps we can still recover the supplies the clans need to survive the winter. The decision to invite outsiders to our land has already reaped untold benefits! Tell me, where have the Winterborn hidden the supplies?" Gulug betrayed the clans. He says the supplies were taken to Frostbreak Fortress. "You located the stolen supplies and uncovered our betrayer? Trinimac surely sent you to us in our time of need! Take this reward for helping our people. And you must present yourself to Forge-Mother Alga. Look, here she comes now." The Winterborn took the supplies to Frostbreak Fortress. "You located the stolen supplies? Trinimac surely has sent you to us in our time of need! Take this as a reward for helping our people. And you must present yourself to Forge-Mother Alga and tell her everything. Oh look, here she comes now." Forge-Mother Alga: "Is this one of the outsiders who responded to my invitation, high priestess?" High Priestess Solgra: "Yes, Grand Forge-Mother." Forge-Mother Alga: "Thank you, Solgra. I will speak to the outsider now." "Forge-Mother Alga would like to talk to you, my friend. Remember that your actions have not gone unnoticed." "I studied at the Mages Guild in Wayrest for many years before traveling across Southern Tamriel. I eventually wound up in the Summerset Isles. That was where I first heard the words of Trinimac and found my true calling." "I have been called to restore the Orsimer to our true destiny. To revive the ancient traditions. The ideals of truth, honor, and unity. This is Trinimac's will and desire. I have my part to play, and you have yours." I thought the Orcs worshipped Malacath? "Yes. My people are stubborn. They see Malacath as our protector, but nothing could be further from the truth. Malacath's passion is vengeance. We cast ourselves as victims and this holds us back. Trinimac's light, however, can restore our glory." You mentioned trouble with extremists. "Followers of both Malacath and Trinimac can be prone to violence. Forge-Mother Alga helps keep things civil, though I fear things will get worse before they get better. The fanatics on both sides act out of ignorance, I believe. Not out of ill-will." Where does the forge-mother fall on the matter? "She sees the path that Trinimac has set before us. Half the wives in every clan owe her favors, and it was her influence that allowed the city temple to be dedicated to Trinimac." And King Kurog agrees with all this? "The king was skeptical at first, but he and a few clan chiefs eventually embraced the will of Trinimac. Most of the other chiefs remain opposed to such drastic change, however. They hold onto the old superstitions and refuse to hear the truth." "I do not wish to delay your journey. I have duties to attend to at the temple and I know King Kurog awaits you at Frostbreak Fortress. Still, in all my travels, I have never encountered so many troublesome extremists as I have here in Orsinium." This page was last modified on 24 March 2019, at 00:10.